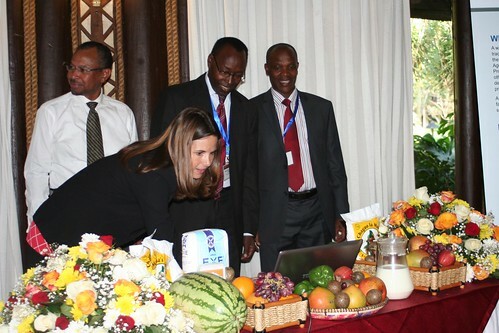 On 27 January 2014, the Regional Strategic Analysis and Knowledge Support System for Eastern and Central Africa (ReSAKSS-ECA) based at the International Livestock Research Institute (ILRI) in Nairobi, Kenya, launched a web portal on mapping and tracking of agriculture investments in Africa (see www.aginvestafrica.org). This portal has been developed by ReSAKSS-ECA in collaboration with various partners and with financial support from the United States for International Development (USAID) East Africa Regional Mission. The overall objective of AgInvest Africa is to track investments in the agriculture sector in line with commitments to implement the Comprehensive Africa Agriculture Development Programme (CAADP) by governments, development partners and other stakeholders. The portal will provide information that supports planning, decision making and monitoring and evaluation of agriculture and food security efforts in Africa. This will help facilitate partnerships, inform discussions on coordination and alignment of investments, guide advocacy and inform policy. The portal will contribute to efforts on alignment, harmonization and mutual accountability under Paris Declaration on Aid Effectiveness. More specifically, the site aims at providing a major contribution towards monitoring implementation of CAADP by tracking agriculture projects and programs by governments, development partners and other stakeholders. AgInvestAfrica adds value to existing initiatives that are working to document and map agriculture and food security investments by national governments, regional economic communities (RECs), multilateral organizations, development agencies, non-governmental organizations (NGOs) and others. In most cases these actors document interventions they are funding or that are located in countries or regions of interest. Until now, efforts to bring together information from different sources into a common platform have been minimal. AgInvest Africa collates information from publicly available sources with additional information gathered from national, regional and international organizations into a one-stop shop, making it easily accessible. AgInvest Africa uses 2005 as the reference year and is under continuous development. It is designed to allow stakeholders upload information about their projects and programmes, while allowing for authentication of information before the information is viewed by the wider public. Currently, it contains information for 15 countries in Eastern, Central and Southern Africa; the aim is to expand coverage to other countries in Africa. Agriculture and food security interventions database. Under the search tab, the AgInvest portal enables users to easily access and retrieve information on agriculture and food security interventions for the countries included in the website according to user search criteria (intervention start and end data, districts, funding agencies, objectives, etc.). Data can then be easily exported into excel format for further analysis. Mapping page. The mapping page allows users to select interventions from the database and view their locations on a map. Graphing tools. These tools allow users to select interventions from the database and represent them graphically as charts (by time or by location). Initiatives and organisations. This page allows users to access contact information of various actors implementing agriculture and food security interventions in the ECA region. These include: public organizations, private sector, producer organisations, traders, agro-processors among others. Links to the actors’ websites are provided to facilitate access to more detailed information about their activities in agriculture and food security in Africa. The launch took place during the ReSAKSS-ECA stakeholder workshop that aimed to disseminate various knowledge products produced by the node. Tags: AgInvest, ReSAKSS-ECA, USAID. Bookmark the permalink.